PRODUCT: ASI 502 Silicone Sealant, Medium Temp (375F/260C intermittant) CLEAR COLOR, Acetoxy RTV cure. 10.2 oz tube. Price/Tube. (24/case; order full cases for added discounts). Kitchen, Bath, food grade compliant (NSF 51), non-sagging. Excellent for kitchen or bath tile sealing. One-part, moisture-curing RTV (room temperature vulcanizing) acetoxy silicone that cures to a strong, washable, silicone rubber which maintains long-term durability, adhesion and flexibility. Acetoxy has natural antibacterial properties and is suitable for kitchen and bath areas. 250 PSI Tensile, 400 % Elongation. Can be applied to vertical or overhead surfaces without flowing or sagging. 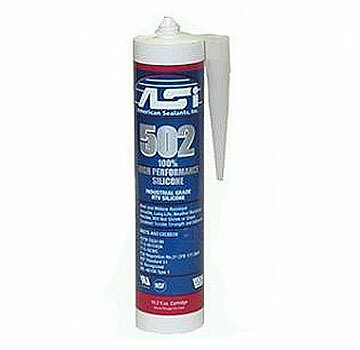 Because ASI 502 is a 100% silicone sealant, it has excellent resistance to weathering including ozone, ultra-violet radiation, freeze-thaw conditions and airborne chemicals. Can handle temperatures up to 400F in the black color. During cure, an acetic acid smell is produced. Limitations: Not paintable. Not for porous substrates which can be stained (such as limestone or porous tile), not for continuous submersion.